Please select options for American Muscle Graphics Matte Black Hood Accent Decal (10-12 GT, V6) at the top of this page. Hey everyone I’m Justin with AmericanMuscle.com and I’m bringing you a couple of different ways to customize your hood, thanks to the AmericanMuscle graphics hood accent decals, and the AmericanMuscle graphics boss style hood decals, available in three different colors for your 2010 and up Mustang. Both the boss style decal and the hood accent style decal are constructed from high quality premium cast vinyl, and are designed to last several years. As always with our AmericanMuscle graphics they are designed and produced right here in house and then tested out on our very own cars first to ensure a perfect fit every time. Basically, if they don’t work on our cars, they’re not going to end up on yours. The boss style hood graphic is designed to give your ride the same exact styling used on the 2012 boss and is available in either white, matte black, or gloss black. 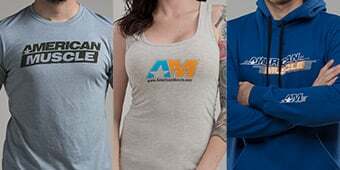 Now this would be perfect for someone who’s trying to replicate the entire boss look, by using the corresponding graphics found on AmericanMuscle.com , or if you just want to use the hood portion to give your factory hood a more aggressive appearance. Now if the boss style’s a little too drastic for some folks out there, then you might want to check out our AmericanMuscle hood accent decals, available in white, matte black and gloss black. Now these go on the side of your hoods cowls giving it a much more pronounced appearance. When it comes to installing vinyl, all you need are soap and water, a squeegee, and a little patience. A little tip to help the install go a lot smoother, it’s a good idea to remove the vinyl from the packaging first, and let it sit out on a flat surface overnight, that way when you do go to install the vinyl it’ll make life a lot easier. Now depending on what panel you’re installing, it should only take you a half hour to an hour from start to finish. Ford really broke the mold when they made the 2012 boss, especially when it comes with the model specific parts and graphics. So if you really want to emulate the styling of the boss, or you just want to change up the look of your factory hood, it’d be a great idea to check these AmericanMuscle graphics. Custom Styling. Give your Mustang a much more aggressive appearance on the street or the strip with a set of vinyl hood accents from AmericanMuscle. These hood accents apply to either side of the hood bulge for impressive custom styling. Matches Boss Hood Decal. 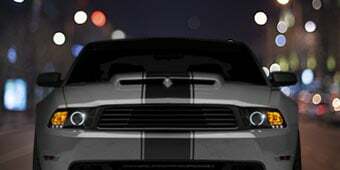 This set of two accent decals are the perfect addition to the Boss Style Hood Decal to completely cover your Mustangs power bulge for aggressive good looks. Application. 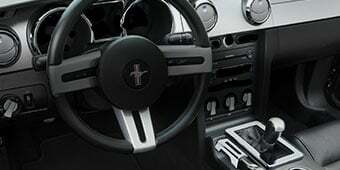 These high quality matte black vinyl hood bulge accents come as a set of two (one for the passenger side and one for the drivers side) and will fit all 2010 to 2012 Mustangs with the factory style hood, including the V6 and GT models. Would this look good with matte black stripes? I have a white 2012 with 2 11 inch matte black stripes from bumper to bumper. I know these would match but I don't want to over do it and have "too much going on." Do you guys think it would look good or is it too much? 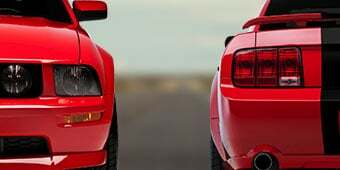 I have the 11 inch strips on my 2010 candy apple red mustang and I think it would look too busy and take away from your strips (only my opinion). 2012 Mustang Club of America V6 Will this decal work well with the 2012 Mustang Club of America V6 in Race Red? The current decals are matte and I want to be sure these with match. 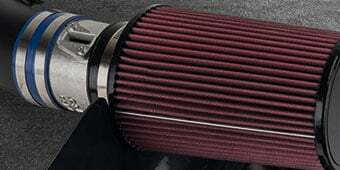 I just installed them on my MCA in Race Red. Couldn't be more happy with the look! Yes it will work very well and its also very easy to install. If you like the aggressive look for your mustang and you want to stand out without adding "too much" this is the way to go!! It looks really good if you have other black pieces on your car as a general theme. My car is Red candy with black billet grille and black mirrors and it looks great. I think you will be fine ..... I looked at the MCA version vehicle but like the more classic rocker panel striping ....but these hood accents will sharpen up the vehicle even more ---- you should like the outcome. 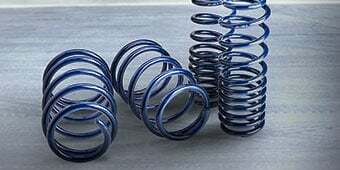 I have these on My 2010 GT. They were on it when I bought it from the original owner. I would like to make a change to the other design option. What is the procedure for removing them ? They have been on for about a year. It is Red and is always garage kept. I am a little worried about paint fade. Use a hair dryer to heat up the adhesive and then slowly peel them off. There shouldn't be any paint fade if it was garage kept. Good luck! About hood spears for my 2012 V6 Can the hood spears be special ordered with a custom lettering. Let me know if they can and how to order them if possible. Matt black. Unfortunately, the only lettering options we have for the hood accent decals would be the 5.0 accents or the AmericanMuscle accents. We don't have any other custom ordering available. The only lettering AM sells is the one with thier logo which looks good, if your looking for more specific custom lettering you should go on eBay but I doubt the same quality will be thier good luck! 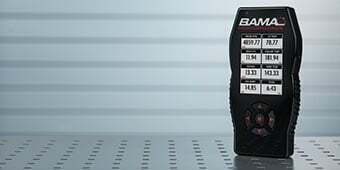 Will this fit my 2013 5.0 GT? These hood decals will not fit the 2013 because the hood is slightly different. Stay tuned though because the 2013 decals are coming soon!! 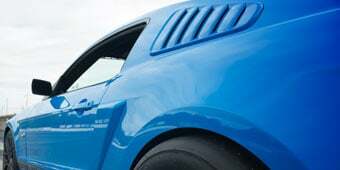 No, Ford redesigned the hood for the 2013, getting rid of the cowl/bulge that these run along. These decals add a awesome look to the hood of the car, and when you have the hood popped at shows, or whenever from the back it looks like fangs it’s pretty cool!!! I love the Matte Black Hood Graphic Accent decals I installed on my pony. Gave it that extra punch! Easy install, durable and looks great. Fits perfectly inside factory character lines and a little extra long to wrap around edge of hood for a really professional look on my 2012 GTCS. very easy to install yourself. take time and make sure to moisten the surface and decal. i think it adds character to your car! Another great graphic kit from AM! Adds style and a wonderful accent to my CS stripe. I put a 5.0 chrome emblem over it, for a final and unique touch. Very Easy To Apply. The only trick is the amount of soapy water that is used and the left over amount on the hood at the windshield. We just wrapped it underneath the hood about a 1/4 inch. In saying that, be sure to clean that area "under the hood" as well to ensure adhesion. 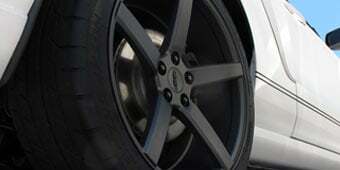 This is my second set, had to replace hood, first one never faded or changed appearance, very good quality. Nice kit with quality vinyl well worth the money!! I'm in the auto body repair industry so installing these stripe took no time at all. They followed the contours of the hood well!!! I would but these again!!! The hood accent stripes went on and look great. The instructions left a little to much for interpretation. Should be put in place and left to dry, then trimmed to fit as this was not mentioned in the instructions. Looks great, easy to install. Have to cut ends, not hard to do. These matte black hood stripes were an amazing purchase. Looks very good on the hood (haha that rhymed) and was very easy to install. 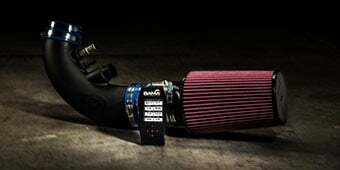 These are a great buy for anyone looking to improve the look of their Stang. Matte black color matched perfect with strips on sides of car. As an amateur, I found instructions and process to be fairly easy. Makes domed hood more noticeable, also matches COA stripping, making for a complete look. These decals were delivered on time. They were easy to apply and look great! Super easy install. Perfect accent piece for silver car! These really set the car off. Look nice and very easy to install.